Once, in the days before corporate sponsor naming rights, we named our sports fields ‘Memorial Stadium.’ When the national anthem was played, it was in honor of those Americans in whose memory the memorial stadium had been built. And, in that time, the national day of recognition that honored them was a day to honor peace, not war, nor even warriors. At eleven in the morning, on the eleventh day of the eleventh month, the guns that had destroyed Europe fell silent. For four years trenches had crossed France and Belgium from Italy to the English Channel, where the flower of the world’s youth killed each other in lines that moved little from the first day of war to the last. 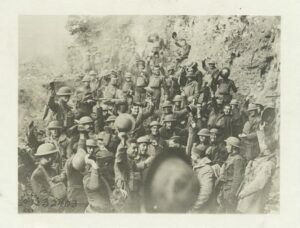 In the Great War, considered by all but the highest commanders and politicians as a mad folly, the foot soldiers marched to battle singing ‘We’re all here ‘cause we’re not all there.’ Until the very end, each of them assumed that they would die going over the top. Vast numbers of them did. A few days before the end, however, and in the uncanny way of armies everywhere, troops in the line knew sooner than their officers that something was up. For example, on November 9, 1918, air crewman Alex Dickie of Breckenridge, Texas wrote his parents cryptically that ‘I am seeing and learning some interesting dope up here’ and ‘you will know all about it long before you get this letter.’ Other letters from other soldiers, British, American, even German, had the same hints that peace was coming. When two days later the war to end all wars did end, America began to count her losses. Our farms, factories, cities, towns, and universities – our families– had suffered 117,000 deaths and over 200,000 severely wounded. America also counted her gains – while our entry in the war may have been the straw that broke the German camel’s back, we believed our boys had been decisive, and said so. President Wilson was a celebrity at the Versailles peace negotiations, his Fourteen Points calling boldly for a League of Nations to insure peace forever. That was what the armistice meant: war had failed, peace had won. America stood for peace. The armistice may have been celebrated but entangling America in the councils of nations was not. Just eight days later, on November 18, the Senate rejected the League of Nations treaty. For the next two decades, America stood at a remove from the world’s only diplomatic body that might have effected peace. The Senate may have said humbug to Wilson’s sentiments but the country did not. Throughout the 1920’s stadiums named ‘Memorial’ were built in every state. Public universities honored their lost graduates and cities their martyred sons in new stadia on whose walls were inscribed the names of Americans who had died for peace in obscure places such as St. Mihiel and Belleau Wood. Rhode Island erected a one-hundred and fifteen feet high fluted column designed by an architect who had fought in France. In 1931 President Herbert Hoover spoke of peace to dedicate the national temple of Armistice Day that our nation erected in a quiet grove near the Lincoln Memorial. And, each year, the sitting president re-proclaimed November 11 as a day of remembrance. Poppies were worn in button holes. Names were read. Graves were visited. America was at peace with peace, but not with itself. After a decade of Coolidge and Hoover austerity the burdens of the Great Depression and high unemployment fell on the shoulders of the men who had survived the war to end all wars. Having been promised by Congress that they would get a pay bonus for their military service, the soldiers were never paid. In 1932 the unemployed, hungry, and homeless veterans came to Washington DC to lobby for their promised pay — and were turned away. On July 28, Hoover ordered that they clear out of Washington. General Douglas MacArthur interpreted the order to mean he should wipe out the camps the old veterans had set up across the Potomac, and he attacked the men he had led in battle fourteen years earlier, routing their tent and cardboard box city with cavalry, tanks, and machine guns. The assault played heavily on voters who turned Hoover out in the election; his successor exiled MacArthur to the Philippines. In 1938, the Congress that wanted nothing more to do with European wars made the 11th of November a legal holiday, “a day to be dedicated to the cause of world peace and to be thereafter celebrated and known as ‘Armistice Day’.” For the first time, the United States honored formally the end of a war rather than the day a war had begun, such as the battles of Lexington and Concord, the firing on Fort Sumter in 1861, the sinking of the Maine. Peace then was urgent; even we isolated Americans knew that the Axis had used Spain as a military test tube and that Neville Chamberlain had cowered before Hitler while claiming that he had bought ‘peace in our time.’ On November 11 we attended services, taught our children that while we had not asked to be dragged into World War I we had ended it, and believed that our future was safe within our shores. It was not to be. In 1940 Hitler marched the French chief of staff back into the very rail car in which Germany had signed the Armistice in 1918, then forced him to sign France’s capitulation. We honored Armistice Day in 1940 anyway, and again in 1941, a month before Pearl Harbor. For the next four years we still celebrated Armistice Day, even while the world heaved under bombs, guns, and battleships. The date didn’t change but America did: by the end of World War II we had proved our might by refusal to accept anything less than the unconditional surrender of every Axis power. Peace was no longer a matter of walking away from war; in our eyes, it was the result of American arms. After Korea, the average American no longer thought ‘armistice’ meant peace. It now meant ‘a miserable line drawn between northern and southern Korea that marked the place where in July 1953 poorly trained, equipped, and led Chinese and Korean communists had forced American soldiers into a stalemate.’ Armistice now meant humiliation, and its holiday was at an end. 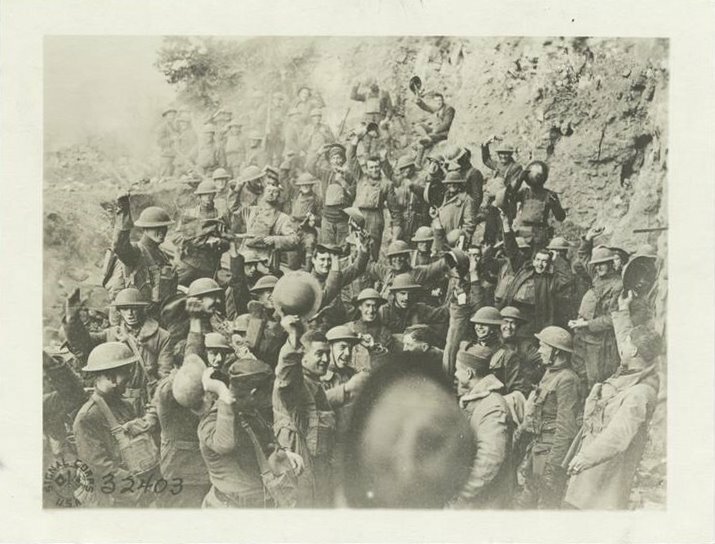 Without saying so, a campaign was commenced to stop honoring Armistice Day and to begin to honor our warriors. Within weeks of the Korean armistice, a Kansas shoe repairman lobbied his Congressman to change Armistice Day. In 1954 Congress changed the name to Veterans Day. Without debate or protest, thirty-five years of nominally celebrating the laying down of arms passed into history. Until 1971 America still closed for the day. Then, in the division over the Viet Nam war, Congress dismissed even the semblance of November 11 as a day to give peace a chance; the holiday moved to the fourth Monday of October to assure a three day weekend. In 1978, Congress restored the date but not the occasion or even the honor, continuing under the name Veterans Day. Since then the only certain celebrants are federal employees and banks and the relentless advertisers of holiday sales for tires and televisions. Almost one century after the peace that gave birth to Veterans Day, the end of the war to end all wars is a mote in the dustbin of history. Our collective memory of the guns going silent around the world at the eleventh hour, of the eleventh day, of the eleventh month, has failed us. The Armistice Memorial in Washington is thoroughly decayed and rarely visited. There are, to be sure, parades, flags, salutes. Marchers march. Bands play. Politicians bleat. Children wave. A grateful nation does honor the men and women who have left civilian life to serve us. But the speeches, the opinion articles and talk shows, the notion of what it is that we are honoring on eleven eleven now carry the unmistakable message that our pride no longer comes from a continual search for peace but from our military might. Regrettably, too many of us hurry through the parades and speeches, or skip them altogether, to use this free day to shop for the tires and televisions advertised at special prices on this special day. But there are no new Memorial Stadiums, built in honor of the peace that followed the war to end all wars, on whose walls where once were the plaques of names of our soldiers who fought for that world peace. We don’t even call them stadiums any more, but arenas, as if they were the sites of gladiators. And we no longer name them for heroes, or even ideas, but for our colossuses of commerce, airlines, phone companies, and others, none of whom paid as much for naming rights as our real heroes paid for peace. Jack W. London is the author of the acclaimed French Letters novels Virginia’s War and Engaged in War, for which he was named Author of the Year 2011-2012 by the Military Writers Society of America. You can read Private Dickie’s letters, and many more, at JWLBooks.com.